Get ready for it to be dark at 4:30. Daylight Saving Time, that nationwide crock, ends this weekend and while most of your devices will be fine with it, you’re still going to have to set a bunch of clocks and stuff. If you’re an Apple user, be aware that some past updates have created problems for Daylight Saving Time so if you use your phone as an alarm clock, be 100% sure it works before depending on it to get you up for work. As you’ve no doubt surmised, I’m no fan of Daylight Saving Time and I have to say, I struggle every year to understand why we all put ourselves through it (with the exception of those few states and counties who smartly ignore it and just confuse the rest of us.) 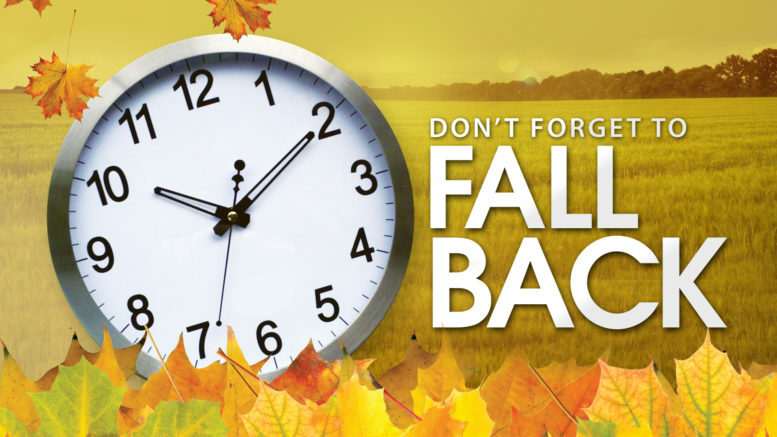 Daylight Saving Time was first widely introduced in the United States during World War II and became a permanent part of life in the 1970s. In the 2000s it was expanded, meaning that most of us spend more of the year in “Daylight” time than in “Standard” time. I don’t know why it’s more fun to say “Daylight Savings” than “Daylight Saving” but it apparently is, since most people do actually mispronounce the term. It’s “Daylight Saving” as in, “you save daylight,” but somehow that point is missed, and as a grammar nerd that bothers me. It’s doesn’t save daylight or save money. Daylight Saving Time does nothing more than enable people who sleep late. As someone who wakes early, I am actually penalized by the exact amount of daylight that the rest of you save. Why? Because daylight isn’t “saved” at all, it’s simply moved to where the less disciplined people want it. It also doesn’t save energy as was once claimed; recent studies attribute almost no energy saving to it. It’s just another dumb idea from the 1970s like bell bottoms and the 55-mph speed limit. It doesn’t have anything to do with Halloween. When Daylight Saving Time was expanded in the 2000s the rationale was to give more daylight for trick-or-treating youngsters. There are two flaws in this argument; It doesn’t matter whether you’re on Daylight or Standard time. It’s still pretty dark at the end of October after the dinner hour. Also in many cities and towns, small children no longer roam the streets on October 31. Instead they are directed to safe areas where local merchants or approved homeowners provide peace of mind instead of potentially dangerous treats. There’s another side to this. It’s really not the right subject for this forum, but I’ll allow it this once. Consipiracy theorists have their own theory. They say that what really happened was that Daylight Saving Time was extended past Election Day. This would potentially favor some groups and not others. This would give one party an advantage. Personally I think that’s kind of silly, especially since in 2018, it’s not even true. Still, stranger things have happened. With smart home technology, you’ll spend less time syncing up clocks. Sure you’ll have to fix everything that’s not internet connected, but at least your entertainment center, your phone and maybe even your thermostat will set themselves. That’s something. It’s not much, but it’s something. Here’s the bottom line. There isn’t a good use case for Daylight Saving Time other than people being accustomed to it. I personally don’t like it, and I wish it would just stop.